Luke Walladge who says he is a “Media, Campaign and Communications Consultant at ALP” and was recently sued for an outstanding debt of $15,000 by a prostitute has decided to tell lies about this site. I think it is important to address his slurs as it gives an insight on how the crooks are working online and is a possible guide to how the election campaign is about to be played out. Dirty tricks and lies will probably become the key strategy given the Labor Party are starting to drop in the polls and a lot of it will probably happen online. But back to the lying and thieving Mr Walladge who after a quick check has close links to the Health Services Union (HSU) and a number of people recently outed on this site at the HSU for their corrupt conduct. I will break the post into parts to make it easier to follow the story. Can you please explain the attached screen shot of the comment you made where you state that my site Kangaroo Court of Australia is soon to be the subject of legal action because of defamatory assertions that I have made about people and organisations. Can you please name the people and organisations that you claim are about to sue me and on what basis and the evidence to support it. I did not receive a response from Mr Walladge. When he says I make “false and defamatory assertions about numerous people and organisations” he is making a statement of fact that I tell lies about people and organisations. The problem for Mr Walladge is that he has no evidence to support that statement of fact as I have never been sued by anyone for defamation let alone found guilty of defamation. The bottom line is that he has defamed me and my site which he is well aware. As for people about to sue me that is nothing more than dribble coming from a fools mouth and as we will see Mr Walladge has a history of threatening people with defamation and not following through. I published a post on the 14th July 2013 titled “Bill Shorten tried to stab Julia Gillard in the back one last time. Return of corruption at the HSU” (Click here to read) In brief the post dealt with the return of corruption at the HSU. As it turns out Luke Walladge was Diana Asmar’s campaign manager for the union election so his motive to tell lies and attack me and this site is clear. I have been told that Luke Walladge has not sued The Age or the reporter Clay Lucas for defamation and the fact that the article is still on the internet supports that. It is a bit rich for Mr Walladge to threaten others for defamation when he is happy to defame others such as myself and this site. The apology by Mike Smith one has to suspect was done after a complaint or defamation threat by Luke Walladge given Walladge’s previous form. Taken at its highest that is only one element of the story that is incorrect, so the rest must be true. I also suspect that Mike Smith would have taken Mr Walladge on face value and believed what he said and would have apologised in part based on information supplied by Mr Walladge. Given we now know that Mr Walladge is a compulsive liar, I think it is fair to say that The Age story is highly likely 100% accurate. You have to laugh where he says “it lets its agenda get in the way of reporting the truth.” Anyone who has read my previous post would know that Mr Landeryou is one of the biggest criminals on the net. At the time Mr Landeryou wrote that comment his wife was already the HSU payroll as General Manager yet he did not declare that in his comment. 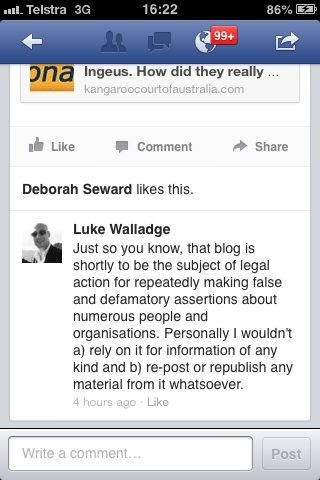 Mr Walladge also made a comment on the post where he says “There are of course numerous other falsehoods, inaccuracies and misrepresentations in the Age’s story, from which legal and other actions will arise.” As I have already stated I have been told that no legal action has been instituted by Mr Walladge so it is just him big talking again. And he fails to state the other “falsehoods, inaccuracies and misrepresentations” which most people would have. 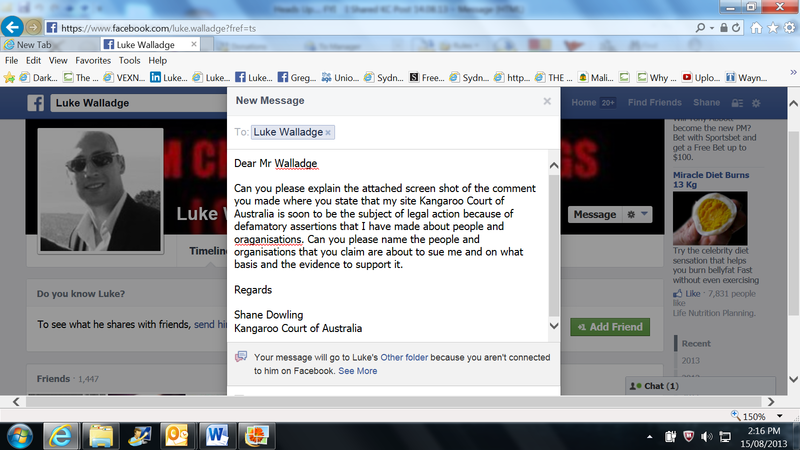 Why the ALP have not ditched Luke Walladge is unexplained unless of course they have and Mr Walladge is lying on his Linkedin page. If the above type of tactics is where the election is heading it is going to be a wild time from here on in. Admin: This site has now raised $4870 which is nearly the targeted $5000. Thank you very much for the people who have donated. Over the next three weeks I will pick up the pace. The first video interview should be published mid-week if all goes to plan. ← Kevin Rudd, Therese Rein and Ingeus. How did they really make the $210 Million? Andrew L has been doing dodgy stuff for years-way back into the mid-90’s. I’m glad you are exposing him. Thanks a bundle. It will take a complete wipeout of the Labor Party at the coming election to rid them of corrupt activity. Hope the ‘Young Labor’ movement is different, so that Labor Party will be a credible opposition truly representing Australians, not just themselves. No surprises here ! These people think they have rights the rest of us don’t have. So far it would appear this is true. They can lie, defame, steal and worse AND get away with it. A great majority of our MSM assist with their lack of spine and the cowardly way they do not report the facts. As so many of these slime bags are becoming exposed one would think those in the media defending them and covering up for them would realise the public will see THEM for the incompetent, traitorous cowards they are as MSM is not do the job and is letting Australia down. I love the way they only attack, when they are found out for what they do wrong!!!!! As the old saying goes, Shane, they can’t “defend the indefensible”! My bet is you won’t get a response from the twit! Australians cannot accept or adapt to liars. Liars and cheats must be exposed, no matter their walk of life. They try to bully people to keep quite with threats of legal action. Media bullies gain strength when victims scurry away, regardless of the veracity of the accusations. I’m glad to see you are standing your ground and exposing the corruption in our political and judicial system. I look forward to your interviews. Thank you for being a vanguard of truth in online blogs. R we there yet: are you kidding? Liars are all we have ever had!!! Glad all these people from the labor party are getting caught out.